Russula cessans, Pinus strobus, and Sciurus carolinensis form an ecological triangle in late fall and early winter in eastern North America. While there are accepted common names for two of these organisms ("eastern white pine" and "eastern gray squirrel"), our poor russulas are stuck with the Latin binomial--probably because no one cares very much about red russulas except the squirrels, and they are notoriously bad at remembering anything--especially common names for mushrooms. 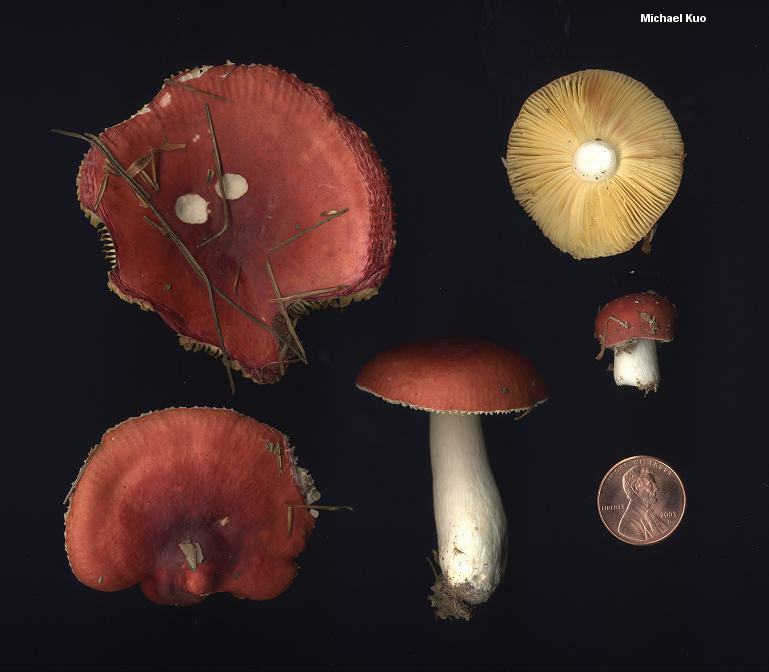 You will probably be wearing a jacket--even a coat--when you find Russula cessans, and you may have trouble finding specimens that have not been nudged, nibbled, or knocked around by squirrels who are darting through the pine plantation, stuffing themselves with one last mushroom meal for the year. 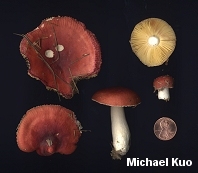 Distinguishing features of Russula cessans, other than its ecology, include its crimson to purplish red cap, its white stem, its yellow spore print and mature gills, and its lack of a distinctive odor or taste. Incidentally, it is a myth that animals have an innate sense of toxicity, and there could easily be a bunch of miserably sick squirrels in white pine plantations every November. "Next year, Sam, I swear to God we're [belch] gonna remember not to eat these things. What are they called again?" Ecology: Mycorrhizal with eastern white pine and possibly other pines; growing gregariously; October and November; eastern North America. Cap: 3-8 cm; convex, becoming broadly convex to flat; dry; smooth; crimson to purplish red, frequently with a darker center; the margin even or becoming slightly lined at maturity; the skin peeling fairly easily. Gills: Attached to the stem; close; pale yellow; unchanging. Stem: 3-5 cm long; up to 2 cm thick; usually slightly swollen toward the base; smooth; white; not bruising. Flesh: White; unchanging on exposure. Odor and Taste: Odor not distinctive; taste mild. Chemical Reactions: KOH on cap surface yellow; iron salts negative to pinkish on stem surface. 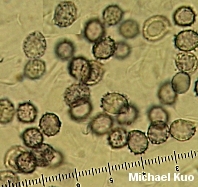 Microscopic Features: Spores 8-9 x 7-8 µ; broadly elliptical or nearly round; with warts projecting to about 1 µ; connecting lines present, often forming partial reticula. Pileipellis a cutis embedded in a gelatinous matrix; pileocystidia cylindric to clavate; 0-3 septate; ochraceous-refractive in KOH and positive in sulphovanillin. REFERENCES: Pearson, 1950. (Pearson, 1950; Kibby & Fatto, 1990; Phillips, 1991/2005.) Herb. Kuo 11060403. The mushroom featured here is "Russula cessans" in the sense of North American authors (Kibby & Fatto, 1990; Phillips, 1991) who cite Pearson's original British description (1950) of a crimson-capped species--as opposed to the more variably colored species described by Romagnesi (1985).